The tree of life is a reoccurring theme in dozens of mythologies and cultures. On the Celtic Tree of Life Arm Bracers, this symbol is represented in a motif befitting its Celtic theme, as the tree is surrounded by one massive Celtic knot. 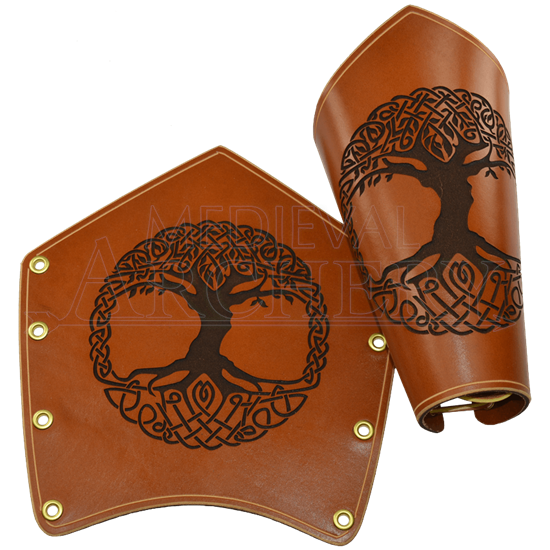 Engraved into this hand-crafted bracer is a tree of life with Celtic styling; the trees foliage is represented as a densely made Celtic knot, while the trees roots, also visible, follow the same motif. It, too, is represented by a large, open Celtic knot. The two knots link alongside the tree to form the circle that surrounds this Celtic tree of life, a symbol of the continuation of life no matter what happens. This bracer is hand-crafted from either armor-grade 13/15 oz. leather or from less defensible but more flexible 7/8 oz. leather. Both make for a wonderful bracer. If you are a fan of Celtic artwork and Celtic knots, this bracer will appeal to you. If not, then the Celtic Tree of Life Arm Bracer is still a fascinating piece of leatherwork.